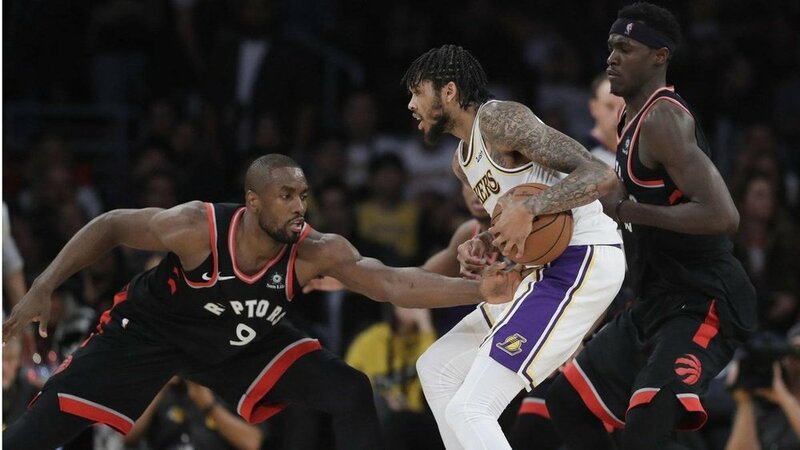 Sunday’s dominating win over the Lakers at Staples Centre showed a lot of positive things for the Raptors. But perhaps the most intriguing part of last night’s game was the absolute clinic that was put on by Serge Ibaka. Last week, LeBron James referred to Lakers’ centre Javale McGee as “A Defensive Player of the Year Candidate.” Now, McGee is normally a pretty good rim-protecting centre, but Sunday night he was absolutely torched by Ibaka, who scored a career-high 34 points, while going 15/17 from the field. Ibaka also added 10 rebounds to complete what was an utterly ridiculous stat line. After a game as good as that from Ibaka, I think a lot of people expected him to miss some more shots the next night in Utah, but quite the opposite happened. Ibaka didn’t start against the Jazz, but he still contributed 14 points and 5 rebounds. Ibaka also didn’t miss a single shot, going 8/8 from the field, which helped the Raptors win their second game in 2 days. Now, obviously Ibaka won’t play this well all season. But if he can even come close to this production, he’ll be a very valuable piece down the stretch. For example, if the Raptors find themselves in a playoff series against the Celtics, they’re going to need someone to guard Al Horford, a centre who can shoot threes as well. Jonas Valanciunas doesn’t match up well against Horford because he’s more of a traditional big man who works in the post. But, Ibaka on the other hand, could do a great job on Horford; guarding him well while also scoring. Something that I like about what Nick Nurse is doing this year is he’s adjusting his lineup based on that night’s matchup. For example, Valanciunas started last night to match up against Rudy Gobert who’s a big interior presence on the glass. Valanciunas also started against other bigs like DeAndre Ayton and Joel Embiid in order to match up with their size. But when the smaller better shooting centres like Brook Lopez and Al Horford play the Raptors, Ibaka gets the start. Serge Ibaka’s contract was a major cause for concern going into this season for Raptors fans. Ibaka was coming off a season where he was wasn’t very effective, especially offensively, and having to pay him over $20 million for the next 2 years didn’t look too appealing. It’s still an overpayment, but at least now Ibaka is making a major contribution to the team, preventing that contract from looking a lot worse. I didn’t at all expect this bounce-back season from Ibaka; I was sold that he would keep declining, but he keeps proving me and many other people wrong with his play. Hopefully he keeps contributing at both ends of the floor, because if he continues to play this well, he’ll be a big weapon for the Raptors in the playoffs.